Here we share the details about the blog platform, video, picture instruments, software, hardware and more to help you set up your own food blog and learn from our experiences. This will help answer your questions on how to start, design, maintain, market and monetize a food blog. Wordpress plugins for food blogs is a list of plugins that we use on inHouseRecipes. We have tried and tested many plugins and selected these to power our site. 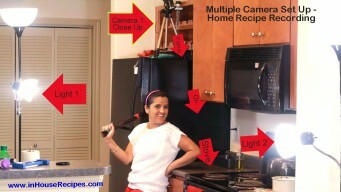 Multiple camera setup for recipe video recording at home. We use one camera for close up and other for distance shots. Using 2 camera is easy and fast. White Font Color For Images and Subtitles is visible on any colored background surface. Use white font with black outline for image text and video subtitle.